There is no better way to celebrate the wide variety of fresh vegetables that are coming to market now than with a lovely grilled marinated vegetable platter. This is also one of the sure-fire ways to get your family to eat vegetables. Make up a platter of these grilled vegetables, put it out on your table and just see what happens. Your family will be picking a bean here, a mushroom there, and those roasted peppers will disappear right in front of your eyes. This grilled vegetable platter is perfect for a picnic or barbecue. This is a perfect picnic dish because it can be made and chilled in your refrigerator for two or three days in advance. When serving, you don't have to worry about keeping it either hot or cold. It is delicious at room temperature. That also makes it a perfect dish for a buffet dinner party. Don't you love it when you can make things ahead instead of having to prepare everything the same day as your party? Let's not forget about the leftovers. As leftovers, these vegetables are perfect in an omelet, on top of a pizza or layered with your favorite deli meats for a delectable sandwich. Yum! Have I convinced you? Good. Now a word of caution. You may think this is an easy peasy, whip it up kind of recipe. Well, it is and it isn't. There's a whole lot of chopping, marinade making and standing in front of a grill involved. You'll reduce the work a bit by using your favorite bottled salad dressing as your marinade but do give yourself enough time to make this dish. Start to finish, the vegetable platter you see in the pictures here took me three hours. I know, that's a lot of time, but I made a lot of vegetables...and did I mention how good the leftovers are? Let's make a grilled, marinated vegetable platter, shall we? First, make the marinated tomatoes. Refrigerate. Prepare the remaining vegetables. Slice the squash and the eggplant lengthwise about 1/4 inch thick. Do this carefully in order to keep the thickness consistent. Wash and cut the stems off the mushrooms. Discard the stems. Cut the stem end off the green beans and cut about one-third off the stalk of the asparagus. Cut the peppers lengthwise into strips, about eight per pepper. Place the squash and eggplant in a 13x9-inch glass baking dish and toss with one-third of the marinade. Place the mushrooms and peppers together in a large bowl and toss with one-third of the marinade. Blanch the green beans and the asparagus. Fill a large pot with water and 1 tablespoon of salt. Bring the water to a boil. Place the green beans in the pot and set a timer for three minutes. Fill a large bowl two-thirds full with ice and water (an ice bath for the vegetables). When the timer goes off remove the beans from the pot with a slotted spoon or kitchen spider and immediately transfer to the ice bath. See how lovely and bright the cold water makes them? Now put the asparagus in the pot with the boiling water. Tie the asparagus together with a piece of kitchen twine so it will be easy to remove them from the water. Set the timer for two minutes. Remove the green beans from the ice bath and drain. Add more ice to the ice bath if necessary. After two minutes remove the asparagus from the pot and submerge the spears in the ice bath. Whew! You're done with that. Drain the asparagus. Place the asparagus and the beans in a bowl and add the remaining one-third of the marinade. Toss lightly being careful not to break the tops off the asparagus. Preheat your grill. It's time to cook the squash, eggplant, peppers, and mushrooms. Place the various vegetables directly on your grill, grilling each side for 2-3 minutes until you get some nicely blackened grill marks. When you remove the veggies from the grill go ahead and return them to the same dish you marinated them in. This will add more marinade flavor as they cool in the dish. Chill the veggies. You can either chill the vegetables in their respective bowls until you are ready to use them or arrange them attractively on a platter prior to chilling. I like a large white platter for displaying these yummy veggies. The key to making your platter look appetizing is to cluster the vegetables together so colors and textures make a visual impact. Let your creativity emerge. These are great tips, I love the tip about putting a tie on the asparagus! What beautiful pictures! Thank you, Breeze. The tip about tying the asparagus sure makes it easy to get the asparagus spears into an ice bath quickly. You know the way to my heart. I LOVE grilled vegetables! I hate to bother you as I know this post is from a few weeks ago, but I am going to make this for my Bunco party in ten days. LOVE the look of it all and the fact that it can be made ahead of time. I understand it all except the part about "make the marinated tomatoes." I don't really see any instructions. Am I missing something obvious? Can you please tell me exactly what to do to those? Thanks so much for any help. This just might be a new go to recipe for me. 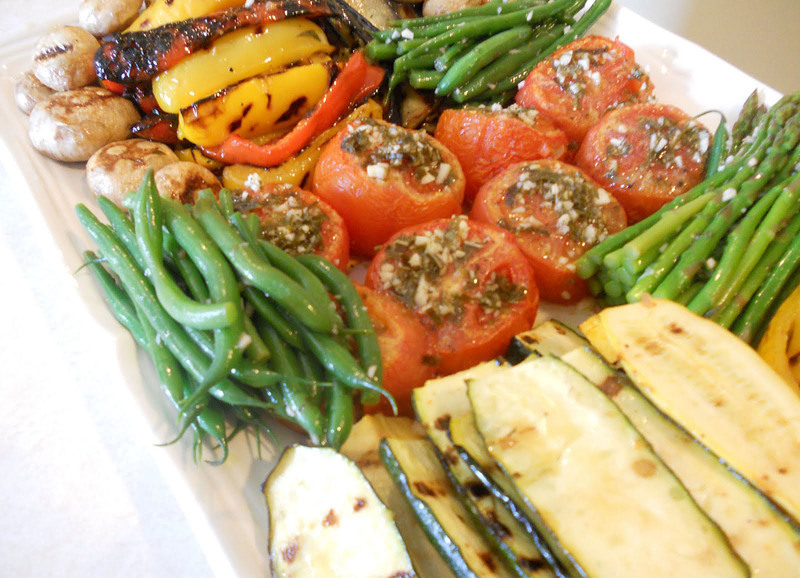 Tobe, I'm thrilled you are going to make this grilled marinated vegetable platter. Your Bunco guests will be wowed by it!!! It will take some effort on your part, but the results are worth it, in my opinion. Leftovers are delicious as well!!!! If you hover over the words, marinated tomatoes, in the first sentence of the directions, you should find a link to the marinated tomatoes recipe. If not, here's the link: http://www.justonedonna.com/2011/07/grilled-marinated-tomatoes.html. Good luck with the recipe and feel free to send me a note if you have any questions. I would love it if you let me know how it came out for you. I hope you love it as much as I do. This is one of my all-time favorite vegetable recipes. Thank you soooooo much, Donna. Sorry, I feel like a bit of a doofus now. Ha! I do think this will be a very impressive addition to my menu. I'm gonna give it all I've got! And as I said before, the beauty of this recipe to me is that it can be made ahead of time and then just pulled out of the fridge to come to room temp. I'm a frazzled mess the day of my party, so I need all the help I can get. Thanks again. I am really happy to have found your blog...looks like there are lots and lots of good recipes to be had. 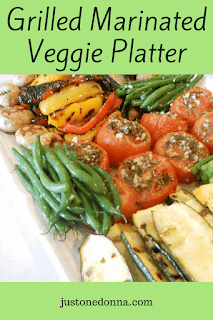 Hi Donna, I'm Jen, first time commenting here :) All I can say is that this grilled marinated vegetable platter recipe was absolutely awesome, you explained it in every possible detail and the pictures were wonderful. I think I completely understood the cooking process for this recipe, so I'll give it a try for sure. Thanks for sharing! Thanks for taking the time to share your thoughts, Jen. I very much appreciate your feedback. This recipe is one of my all-time favorites. The platter makes such a lovely presentation and the grilled vegetables are delish! !